When Kim Hartlinger - eighteen and spoiled - arrives on a mission trip to Mexico and discovers, to her chagrin, that she'll be doing construction in a remote village without plumbing and electricity, rather than evangelism in a medium-sized town with a fast food joint, she has only two choices. "Rough it" (which isn't exactly what Kim had in mind when she signed up for this trip) or turn around and head home. Will Kim be able to touch the villagers' hearts with the Gospel? Or will her time in Mexico be up before she gets the chance? 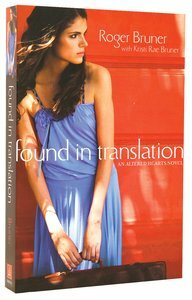 About "Found in Translation (#01 in Altered Hearts Series)"
When Kim Hartlinger—eighteen and spoiled—arrives on a mission trip to Mexico, she discovers to her chagrin that she’ll be doing construction in a remote village without plumbing and electricity, rather than evangelism in a medium-sized town with a McDonald’s. . . Will Kim be able to touch the villagers’ hearts with the Gospel? Or will her time in Mexico be up before she gets the chance?